As a reader, I love to find debut authors and follow their writing careers with their subsequent novels. When the book by the debut author is Southern fiction, it is an even bigger treat because that's my favorite genre to read. In the past two years, I have been lucky to find two debut authors of southern fiction and follow their careers - Kristy Woodson Harvey and Donna Everhart. Both authors had fantastic debuts (Kristy's was Dear Carolina and Donna's was The Education of Dixie Dupree) and each of them followed them up with books that were as good or better than their debuts. Now I have a new debut author to add to my list -- Heather Bell Adams. 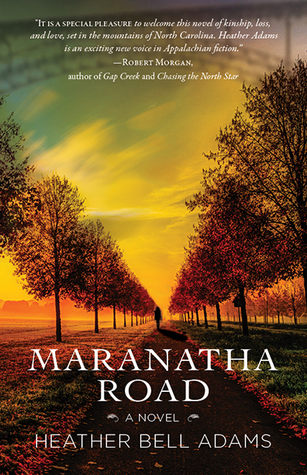 Her first novel, Maranatha Road is southern fiction at its best. I can't wait to see her future books. The word Maranatha means that 'hope is coming' and is the perfect title for this book about two women who love the same man. The man is Mark, who dies very early in the novel. The two women who love him are Sadie, his mother and Tinley, the girl who is pregnant with his baby. The novel takes place in a small mountain town in NC where there are no secrets and everyone is overly concerned with their neighbor's business. After Mark dies, Tinley goes to see his mother to tell her about the baby. Sadie won't believe her - she had never met the girl plus Mark was engaged to someone else. Sadie turns Tinley away and Tinley has to cope with life as best she can. She has no family and no one to turn to so her life is very difficult especially when she has to make a decision whether to keep her baby or give it up for adoption. It's only later, when Sadie starts putting the pieces together (with a lot of help from the town gossips), that she begins to believe what Tinley told her and tries to undo her mistake of sending Tinley away. The two main characters in this book are so well written that they fell like people I know in my life. They are both trying to be strong and trying to make their way through life without hurting other people. This is a book about love and family and forgiveness! Wonderful debut.